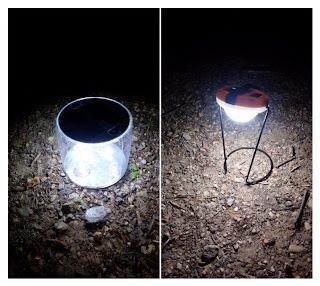 I traveled down into Rock Creek Park last night to get some good shots of my two new solar lanterns. There's a lot of light pollution in DC and I'm only a 5-minute walk from the Park. It was convenient but I felt a bit awkward squatting on a trail taking a photo-shoot of camping equipment. Now I know how photographers at REI feel. The two lanterns in question are a Luci Original and a SunKing Pro. I was gifted the Luci by Scott Sklar, the solar energy wizard in Virginia (http://bit.ly/1HlGP8O). I decided to buy the SunKing myself because it's one of Solar Aid's weapons of choice. People can give you positive and negative reviews, but that means nothing until you've tried it for yourself. Here's what I've found. Luci spreads light out really well and SunKing can direct a solid beam to light your path. Both are very durable--I've dropped them a number of times and no problems yet. Both are great for reading but to truly light my bedroom, I'd need multiple of each. Check out the comparison in numbers and if you're in the DC area, I'm happy to show you either of these.